UPDATE 1: NOAA extends watch to 48 hours. Charged Particle Cloud from Sun heading towards Earth. 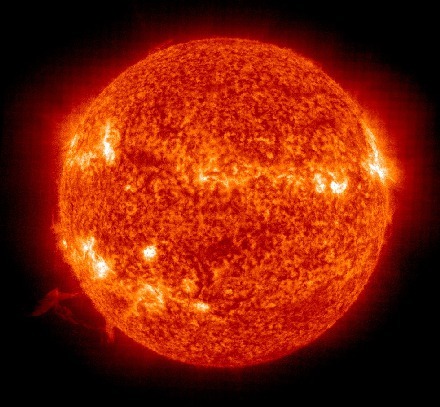 The National Oceanic and Atmospheric Administration (NOAA) Space Weather Prediction Center has issued a 48 hour magnetic storm watch indicating a Coronal Mass Ejection (CME) emanating from the Sun may be heading towards Earth. 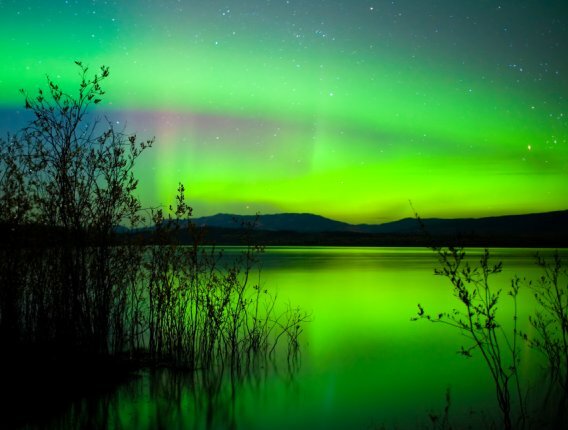 A CME is a fast moving cloud of charged particles which can cause a Northern Lights display. NOAA indicates that the initial disturbance should be caused by the "combined glancing blows from three CMEs." Later the disturbance might be enhanced by the effects of the X-Class solar flare that occurred on March 11, 2015. The watch begins at the time indicated above. It should be noted that the beginning of the storm watch does not necessarily predict the arrival time of the CME cloud, rather it indicates that, within that 48 hour period, increased activity is expected. Real-time Aurora Borealis forecasts can be obtained at the Aurora Borealis Forecast page at Soft Serve News. NOAA estimates the CME currently headed towards Earth might produce a Kp number of 5, but that's never fully known until it hits Earth. Experienced Northern Lights hunters are familiar with disappointment. Predictions of when the CME cloud hits the earth are not always accurate. Sometimes CME events produce much smaller displays than expected, or even none at all. Also, it is possible the main auroral event happens during the day and therefore can only be enjoyed by people on the other side of the world where it's dark.